Who stripped my Dehradun off its charm? There are more shops, branded stores, malls and eateries in the city than people who would and could shop and eat in those places. When I was growing up in Lucky Manzil, ours was the only farmhouse this side of the Cantonment or in the entire Clement Town, Dehradun; apart from the sole other, but extremely badly kept plot and house right next to ours. There were bungalows on Turner Road and in Subhash Nagar, several spooky colonial houses harking back to the British times, old-style, large barrack houses in the Cantonment across the road from us. Then, there were some new houses too that came up almost overnight in portions of plots sold by original Doon residents and there were mud houses in the village not too far away from us. But ours was the only big house on the farms and in the midst of farmland with trees and flowers and all other kinds of foliage. Back in the 1970s, when Ma had not built the flats at the back of the land, Lucky Manzil looked even bigger and scarier, at least to a child’s eye. We were so glad when Group Captain Talukdar, one of daddy’s acquaintances, bought the land next to ours but were extremely unhappy when he didn’t build upon it for years and years, ruing about the fact that how under-developed this part of Clement Town was. The farms around kept changing form with every season, as did their produce ranging from wheat to maize to cucumbers and potatoes and some rice too. The farmers sat on their mile-high perches to watch over their crop and shoo away the pestilent birds and other irritants that attempted to prey upon the richly growing grains. The farmers would drop in at Dhir memsahib’s place, armed with their produce of corns-on-the-cob, lush, green cucumbers, fresh peas and so on and scurry out before Ma could pay them for it. It was an onerous task to get them to take money for the gifts they came bearing and it was even more difficult to placate them as they took grave offence at being paid for what they brought from their heart. Only Ma’s kindness and sweet tongue managed to win them back. Now, there are hardly any villagers that I know personally or get greeted by. For one; a lot of them have grown and flown the nest; but largely because I do not have the aura that their Dhir memsahib had about her. All through my school years I hated using the narrow footpath - pagdandi - in the middle of the farms at the back of our house to get to No 3 Bharuwala - the first sign of civilisation to catch, first the blue bus to St Mary’s and then the three-ton Army truck to CJM in the city. I loathed it when Ma would run after me with my glass of milk that I would have conveniently “forgotten” on the breakfast table. I hated it when I had to breeze past the tall, green maize plants that grew way above me. I detested that they stooped over the tiny footpath making it difficult for me to manoeuvre my way out. I was disgusted that some leaves tended to stick to my white skirt or the roughness of the maize roughed up the skin on my elbows. I abhorred it that moving through them scared me a little, sometimes a lot as the maize towered over me. It was simply wretched when I had to traverse through cut wheat. Any of you who may have done that would know how badly the cut, dried vestiges of the wheat plant prick and hurt. I hated the plants when they grew to their full bloom in the monsoons as they came in my way. I hated it when the crop had been cut and the farmlands lay barren. And in between the two came the dreadful time when the dried wheat plant was cut at the farm, causing deafening noise and so much of husk and dust to fly around. In short, I did not like living in Lucky Manzil much in those young years. To our mind, we lived in the boondocks, in the languorous, laidback backyard of the slowly modernising city. The only time our chests puffed up with pride was when we would step onto Ma’s soft, carpeted front lawn to walk barefoot on the morning-dew covered grass. 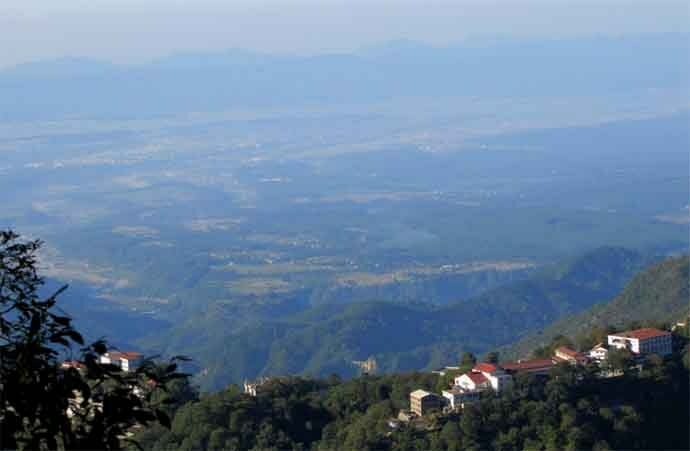 Or when friends came over and insisted on being served tea and snacks in the lawns and gasped at the sight of Mussoorie hills that could be clearly seen "from your garden", as they would exclaim with sheer excitement. Oh, in those moments, hubris would have felt small in the face of our pride in our house. We also loved it when post-dinner, we would step out, off the large verandah, for fresh air and try to count the twinkling stars that we felt were at our arms length. After all, the queen of hills is only 45 minutes from where we live and those stars were actually life lit up in the hill houses. Back then I would cycle down the Cantonment roads up to and beyond the point where a Dakota plane had crash-landed and was permanently installed as a touristy sight, pick a wild flower here or a toadstool there, race to Golden Keys - the Army club - for a game of table tennis, or for dance, zip down a sloping road peddle-free to get to a picket-fenced house or two. Fed to the gills on Enid Blyton and her The Famous Five, I had devised a game of ringing door bells and scampering out amid peals of laughter before the lady of the house opened the door. Now, some barracks have been razed in one area to build a huge Army warehouse, obviously populated but devoid of any "life and living". Strange things like rope drawn barriers have come up on our childhood’s freeways asking for identity and proofs. And ringing door bells will get strange looks and angry exchanges in place of mirth and merriment. Lucky Manzil itself has been dwarfed by buildings all around. Barring one large field, all other farms have lost their life to concrete and construction. With road blocks, traffic and population and shops spilling onto the roads, it takes much longer to get to Mussoorie, which has lost its sheen and shine too. Once I left home for the greener pastures of Delhi, I would return every month for a weekend stay. With each visit back I found the love and pride for Lucky Manzil and Doon Valley growing in leaps and bounds. Having witnessed how the city folks lived and strived, I soon became aware of how privileged we were to be in the lap of nature and how much premium others put on what we found to be just a part of our everyday existence. Now, even more so, when luxury is defined by the views, the quietude and calmness of the surroundings, the lushness of nature, pristine quality of faraway places that take us as away from the chaos and clutter of the city as possible, we look at Lucky Manzil with renewed love, interest and respect. When I see people from metro cities plan out village homestays, book holidays for themselves in far-flung places that promise no connectivity to both the wired world and rest of the population, and when I note that the professionals are chucking up plum jobs to live on the outskirts and engage in an organic life of farming, I miss what we had served to us on a platter. I am angered by how we all have squandered it away. And I regretfully acknowledge that we will never get it back. A lot has been taken away from the blissful beauty of my hometown. There are more shops, branded stores, malls and eateries in the city than people who would shop and eat in those places. Yet, each day a tree is cut to widen a street which, very soon, will not be able to accommodate another vehicle. Almost every day a restaurant comes up only to boast of more staff than guests. Weather is always a great ice-breaker, conversation starter and filler of empty time. Today, even in Doon, we talk about increasing temperatures that threaten to touch the Delhi levels. Rampant, ruthless cutting of trees in the name of development has ensured that we have more dust and less denseness of shrubbery that was like a green cape that Doon wore. Our greed for so-called growth and mindless development has led to more noise and air pollution and less regard and respect for flora and fauna, and all other beings, including other human beings. Some of us still feel bad that our selfishness has made us acutely short-sighted while the rest of us merrily go on chopping more trees and building haphazardly in every direction. We simply called it our home then. It is sad that we did not realise its importance back then. It is worth pondering what all we are prepared to give up now to get back to how we were and just how we lived.